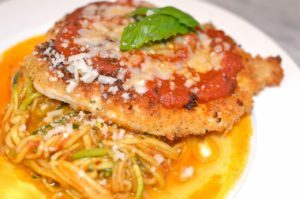 Chicken Parmesan is one of those dishes that always sounds so good to me at restaurants, but I hate ordering it because I leave feeling sickly full every time. 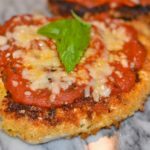 I created this recipe so I could still enjoy Chicken Parmesan but I don’t feel bad about eating it! 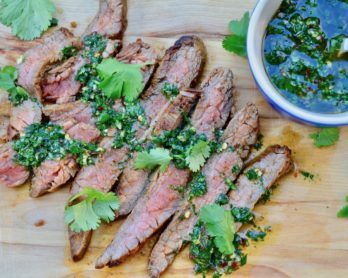 This recipe is super quick to make as well which makes it a great weeknight meal in our house! 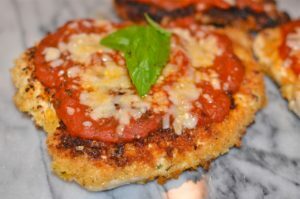 I love buying store-bought zoodles and good quality tomato sauce which cuts the cooking time of this dish in half! My go-to tomato sauce is Roa’s Tomato Basil Sauce which has only clean ingredients and so flavorful- I keep it stocked in my pantry at all times for quick weeknight meals. 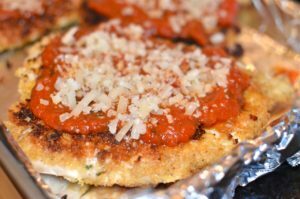 I hope you like this lightened up chicken parmesan as much as I do- enjoy! 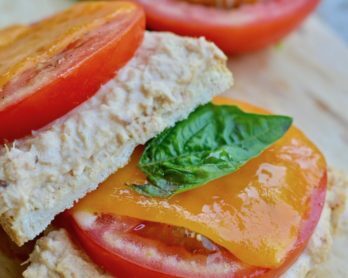 Place the butterflied chicken on a cutting board or flat surface. 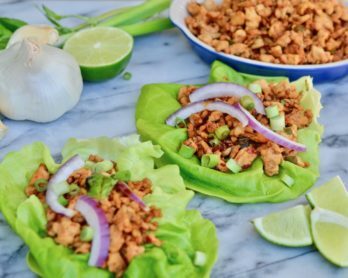 (To butterfly the chicken you simply cut it down the middle until almost to the other side, without cutting the chicken in half- this will give you a larger/thinner breast to work with.) 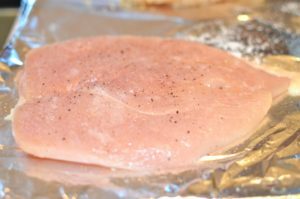 Pound the chicken until it is about ¼ inch thickness and even all around. You don’t want some parts of the chicken thicker than others because this will make the chicken cook unevenly. 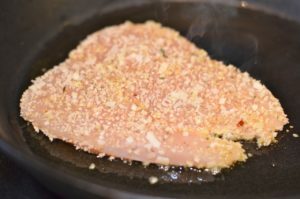 In a shallow bowl or plate, combine the panko, bread crumbs, spices, ¼ cup pecorino, salt and pepper. Mix it to make sure everything is evenly combined. Then, in another dish crack the 2 eggs and mix with 1 tablespoon of milk or water. This is just to thin out the egg mixture a bit. Time to dredge. Season the chicken with salt and pepper. 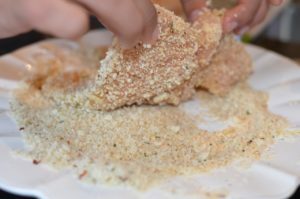 One at a time, dip each breast into the egg mixture and then into the bread crumb mixture. 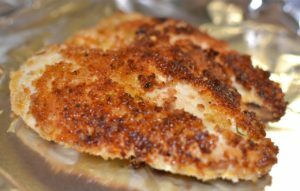 Place all the breaded chicken breasts on a baking sheet to get ready to cook. In a large cast iron skillet, pour 2 tablespoons avocado oil and 1 tablespoon ghee in the pan over medium/high heat. When the oil and ghee are hot, you can add the chicken to the pan. 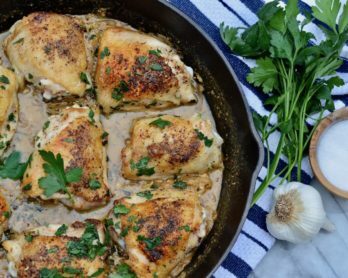 You do not want to over crowd the pan- if you need to cook the chicken in batches that is perfectly fine. Cook the chicken for 5-7 minutes on each side, or until the chicken is golden brown and mostly cooked through. The chicken will be pretty thin so it shouldn’t take too long to cook. When all the chicken is done cooking, put them back on the baking sheet and set aside. In a large skillet, heat up the tomato sauce on low heat. Spoon 3-4 tablespoons tomato sauce over each piece of chicken (the amount will vary, depending on the size of the chicken.) I like to leave some parts of the breading uncovered so the chicken isn’t completely smothered in sauce. 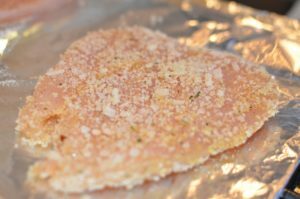 Then, sprinkle about 1-2 tablespoons of pecorino on top of the sauce of each chicken breast- you can use more or less, the amount of cheese is totally up to you! Put the chicken parmesan in the oven to brown the cheese- this should only take 5-8 minutes. You do not want to overcook the chicken! While the cheese is melting on the chicken in the oven, add the zucchini noodles to the sauté pan with the rest of the simmering tomato sauce. I like to add a couple tablespoons of pesto and some red pepper flakes to the zoodles too, but that is optional. Turn the heat up to medium and cook the zoodles with the sauce to heat through and combine all flavors- this should only take about 5 minutes. To serve: Place 1.5 cups of zoodles with the sauce on a plate. 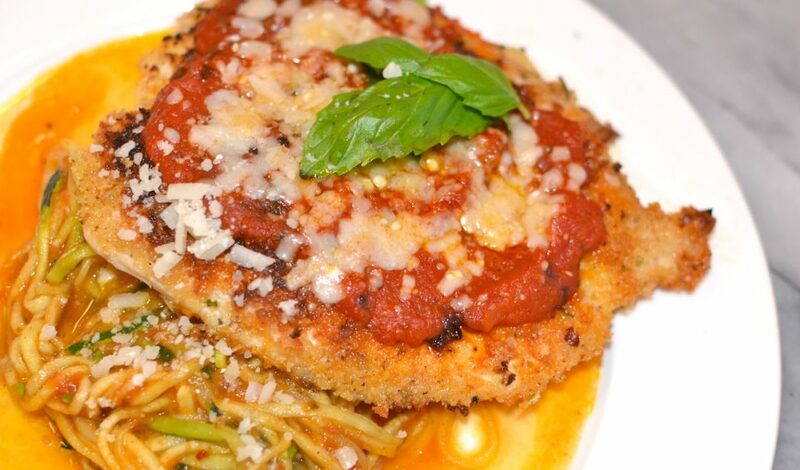 Top with the chicken parmesan and some fresh chopped basil. Serve immediately and enjoy! 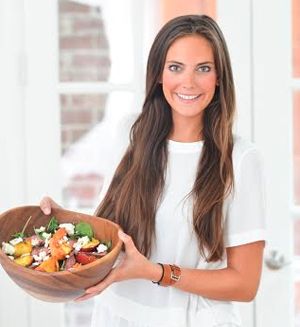 Culinary school graduate, Rachel Hutchinson shares her inventive recipes and secrets to healthy eating without sacrificing flavor. Follow along with her to spice up your kitchen skills and looking cute while cooking! Get our latest blog posts in your inbox!